Cause of death in West Virginia differs for age groups. Many are worsened by excess omega-6 eicosanoid actions. Some are worsened by food energy imbalances. Many healthcare costs are worsened by too much omega-6 action. 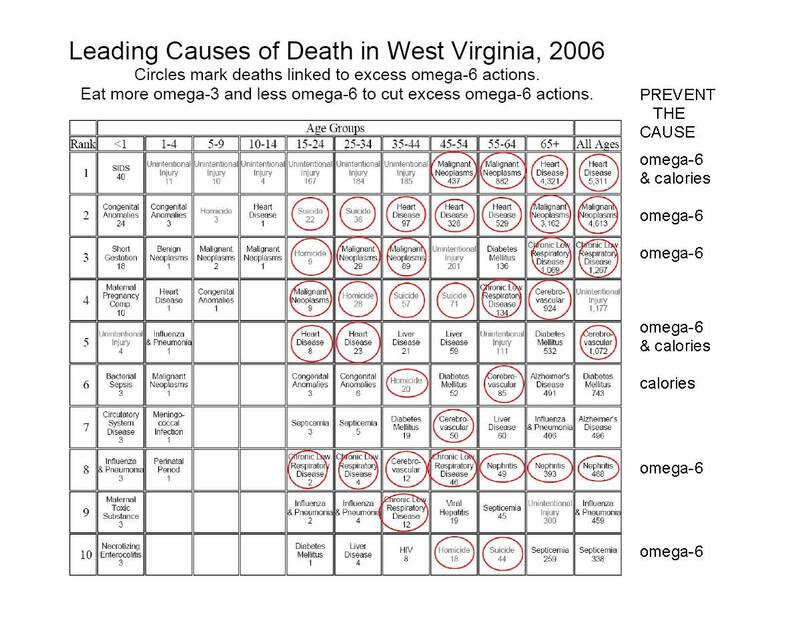 Excess omega-6 eicosanoid action links to cause of death. The eicosanoids act at selective receptors which are on nearly every tissue in the body, affecting nearly every major human physiological event and health condition. Many drugs lower the risk of harm from omega-6 eicoanoid over-reactions. Fortuately, omega-3 nutrients also lower the risk of harm from omega-6 eicosanoid over-reactions.